There are probably very few people who haven’t heard of the MGM Hotel and Casino resort in Las Vegas. 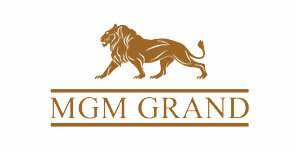 MGM Grand is the largest hotel in the US with over 5,000 rooms and it is the third largest complex in the whole world. There are very few other locations which can match its grandeur. The casino is the central part, or at least the part we are interested in most and at MGM Grand you’ll have the opportunity to enjoy in a spacious gaming area of over 170,000 square foot. In addition to the gaming area, there are over a dozen of restaurants, several nightclubs, as well as other amenities. The MGM features few permanent shows, including the extremely popular Brad Garrett’s Comedy Club. David Copperfield also holds regular shows at the MGM. The gaming offer at MGM is truly remarkable – slots, poker, over 50 types of whiskey on offer, friendly and skilled dealers, a special rewards MasterCard and many other perks. Betting on sports and races is also available. Speaking of table games, there are 9 different kinds of games, but we are primarily interested in Blackjack. There are about 50 Blackjack tables at MGM Grand, with a couple of Blackjack varieties at offer. Most of the games feature six decks. There are over 25 tables featuring 6-deck shoes where the dealers are supposed to hit soft 17, so this is the most commonly played Blackjack game at this casino. Double downs are allowed, re-splitting aces is also allowed. Players are able to double down after splitting and the surrender option is available. The house edge with this rules is 0.46%. The minimum bet on these tables is $15 when the action is slow, usually during workdays it is $25, whereas during weekends and other busy days it is $100. The maximum bet is $10,000. There are more than 10 tables where players can enjoy a slightly better house edge. Namely, there is 6-deck Blackjack which has the same rules as the above-described variant, with the only difference being the fact that dealer stands on all 17s. That makes the house edge significantly lower – 0.26%. 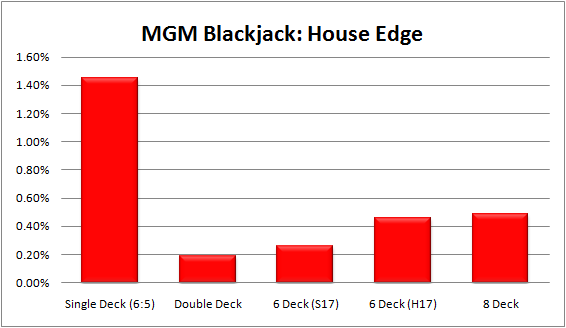 That is definitely one of the lowest house edges that you can get on Blackjack. The betting limits at these tables are the same as the ones for the version where the dealer hits on soft 17. However, it should be noted that some Blackjack tables at MGM Grand the Blackjack pay-out is 5 to 6, which increases the house edge to 1.6%. There are two tables at MGM where you can play double-deck Blackjack. The minimum bet here is either $50 or $100, whereas the maximum is $5,000. The dealer always stands on soft 17, players can double any two cards and are allowed to double after split. However, you won’t be able to re-split aces or surrender. The house edge for this game are about 0.2% if the pay-out for Blackjack is 3 to 2, whereas it would increase to 1.59% if the pay-out is 5 to 6. Single-deck Blackjack is also offered at MGM, and here the betting starts at $15, whereas the maximum amount is $5,000. Players are allowed to double down regardless what are their two cards and they can double after a split. There 6 one-deck tables and they all pay 6 to 5 for a Blackjack, which makes the house edge as high as 1.24%. Eight-deck Blackjack is another option available at MGM. You can play this variant with a minimum bet of just $5, or $10, whereas the maximum amount is $5,000. The dealer hits on soft 17, re-splitting aces and surrender are allowed and so is doubling down after splitting. The house edge on this version is 0.48%. In addition to common types of Blackjack, now MGM also offers Blackjack Switch. Blackjack Switch is a variant where the player is dealt two hands and is allowed to change, i.e. switch cards between hands. In order to compensate for this, Blackjack pays out only 1 to 1 and dealers hard 22 is a push against any bet, except a natural Blackjack. The minimum bet on Switch is $10, whereas the maximum is $2,500. MGM used to have a reputation of one of the more liberal Las Vegas casinos in terms of card counting. There are usually a lot of people in the casino and specifically at the Blackjack tables, especially during holidays and weekend days, which means that the casinos surveillance team is quite busy. If you’re betting in the area where the dealers are supposed to stand on soft 17, you’ll notice that there are a lot of high-rollers there, which makes it a lot easier to go unnoticed. The double-deck games are closely watched and it is not easy not count cards at those tables. There are some indications that in the last few years, MGM got a bit more restrictive, but it is still possible to count cards, if you keep your sessions shorter, don’t increase your wager too much and avoid tables that have a lot of ‘heat’. MGM is not only one of the best casinos in Vegas, but it is also one of the top casinos in the whole world. It is a perfect option for all casino lovers and especially for fans of Blackjack. The betting limits are quire flexible, and there are 6-deck, 8-deck, single- and double-deck games. In addition, you can also play Blackjack Switch. The only downside is that, from until recently, some of the tables at MGM pay 5 to 6, instead of 3 to 2 for a natural Blackjack.